Dr. Shashikant is a M.B.B.S., M.S. (General Surgery), FMAS (Fellowship in Minimal Access), F.I.S.C.P. (Fellow of International society of Coloproctology). Performed more than 10,000 surgeries in past 20 years including minor, major & laparoscopic surgeries. Lifetime member of the International Society of Coloproctology. 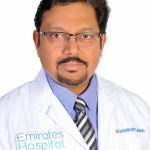 Visit our family at EHDSMC and get to know more about Dr. Shashikant Jadhav and how he can cater to your health needs.